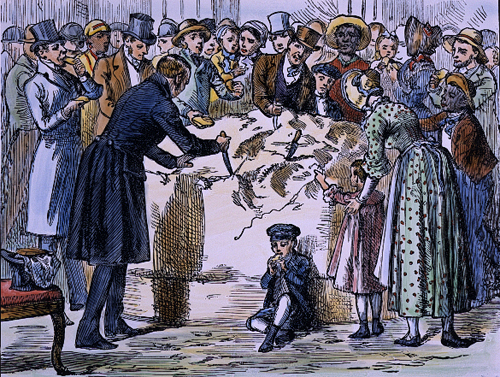 So did you know that in 1836 a New York farmer presented Andrew Jackson with a mammoth wheel of cheddar cheese as a gift? Weighing more than 1,400 pounds, it was four feet in diameter and stood nearly three feet high. Jackson let the gift sit, aging, for more than a year in the vestibule (lobby) of the White House. A few weeks before leaving office, he invited the public to a reception in honor of George Washington’s birthday. According to eyetwitness accounts, thousands of well-wishers swarmed to the White House, hoping to get a glimpse of the departing president – and a piece of the cheese! When the last guests finally left, all that remained of the cheese were the pieces that had been ground into the carpet, smudged across the damask walls, and smeared on the silk curtains. Although there wasn't much cheese left for Jackson to enjoy, you can make this tasty recipe for Cheddar Cheese Puffs if you've got a crowd to entertain this weekend! In a medium sized saucepan, add the water, butter, and salt, and bring to a boil over high heat. Reduce the heat to medium and add the flour all at once. Stir rapidly. The mixture will form a dough ball that will pull away from the sides of the pan. It helps to use a wooden spoon to stir as the dough will be rather thick. Continue to cook for a couple minutes. Remove the pan from the heat and let cool for a couple of minutes. Stir so that the dough cools more evenly. You want the dough to be warm, just not so hot that when you start adding eggs they cook as they hit the dough. Add the eggs one at a time, stirring after each addition until the eggs are incorporated into the dough. (Do this part in a mixer if you want, or by hand with a wooden spoon.) The dough should become rather creamy. Stir in the grated cheese, thyme, and a few grinds of pepper. Preheat oven to 425°F. Spoon out small balls (about a heaping tablespoon) of the dough onto a Silpat or parchment lined baking sheet, with at least an inch separating the spoonfuls. Place in oven and cook for 10 minutes at 425°F. Lower heat to 350°F and cook for another 15-20 minutes, until puffed up and lightly golden.